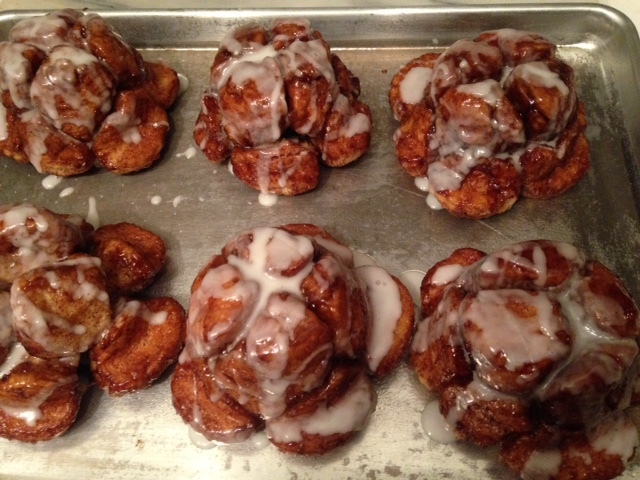 Monkey Bread will expand beyond the upper level. and sugar and mix. Mix the flour and salt in a standing mixer fitted with a dough hook and mix at low for one minute. Then slowly add the milk mixture. Once the mixture has gathered, increase the speed to medium and mix for 8 – 10 minutes. The dough should pull from the sides and gather at the hook. You may need to add a little more flour if the dough appears to wet.. Coat a large bowl with vegetable spray (Pam), remove the dough from the mixer and place the ball of dough in the prepared bowl. Flip the dough so that both sides are coated with the vegetable coating. Cover with plastic wrap and allow to rise for approximately 1 – 2 hours. The dough should double in size. 3. Now make the coating for the dough. Mix the brown sugar and cinnamon together in a medium size bowl and in a separate bowl place the melted butter. 4. After the dough has doubled in size, remove it from the bowl and place it on a flour surface and cut into 60 equal pieces. Roll each piece into a ball and begin coating the dough balls. Using both hands one for the wet and one for the dry mixture. Place each dough into the butter (wet) then into the brown sugar (dry) mixture. Place 10 balls into each large muffin cup in layers. 5. Cover the muffin pan with plastic wrap and allow them to double in size, which will be approximately 1 – 2 inches above the pan. 6. Heat the oven to 350 degrees. Place the Monkey Bread into the oven and bake for approximately 30 – 35 minutes. When baked allow the Monkey Bread to cool only a short while 3 – 5 minutes, any longer and it will be difficult to remove. Take a sheet pan and coat it with vegetable spray, when the bread cools, turn it over and allow them to drop onto the sheet pan.